I’d like to think that I specialise in fitted furniture and storage solutions such as wardrobes, alcove shelving, cupboards as well as bespoke furniture. I once used a slogan 'If its wood anything is possible', well I do my best! 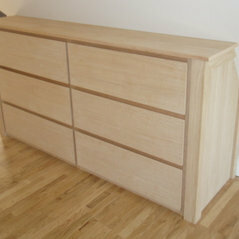 General carpentry,made to measure furniture, fitted wardrobes and all aspects of bespoke carpentry. I live on the borders of East London and Essex and cover most of that area as well as travelling into Central London and outer Essex from time to time. City & Guilds in Carpentry and Joinery as well as Interior Design. Member of the Guild of Master Craftsmen.